and make them seem so fresh. people really use their homes. 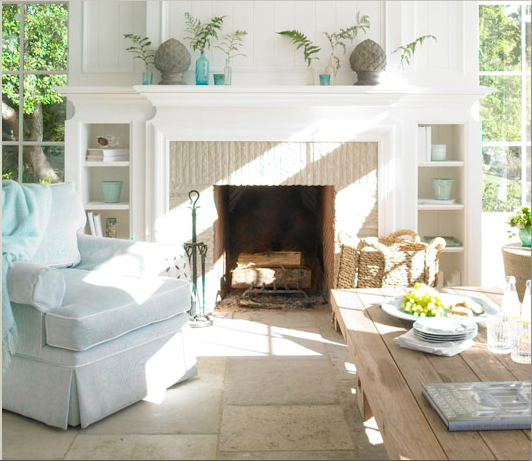 combine to create some of the loveliest spaces. and two stand out, master bathrooms. are a trademark feature of a Louise Brooks home. of home decor products, called…oomph ! good luck with your decision on your project! Wow! I thought yesterdays was beautiful but this collection of work is so amazing. That built in birdhouse is such a unique idea, the exteriors are gorgeous as well as the interiors. So nice! So many special touches. These pictures are so beautiful and I just adore those tables! I love visiting you as you always share such lovely things! Dang! She's good. 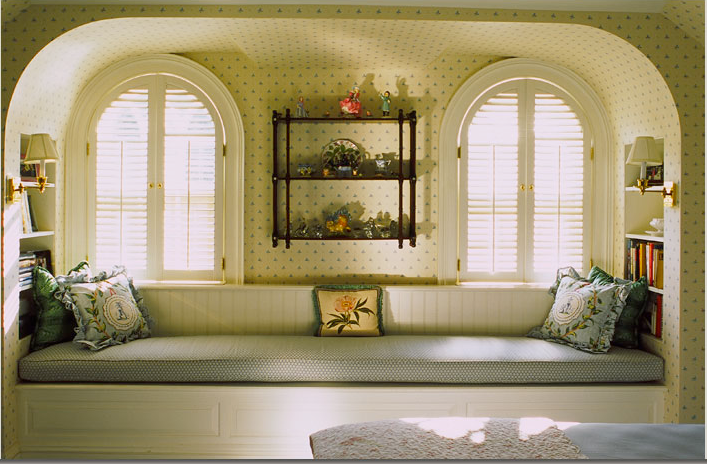 That built in bench with the arched windows? How I do I get one of those? So funny, b/c I was going to mention them in my comment yesterday but didn't want to overstep. I am a complete fan of their work. Both the kitchen with the urban electric lanterns and the fabulous 2nd bathroom have been posted on my blog and are in my new home inspiration files. I didn't know about the Oomph collaboration….how fun….love Oomph products. Louise is so talented and knows how to incorporate that special touch to make a home unique – that white kitchen is fabulous! Really gorgeous work! I love their table design, very cool! A friend from school had Louise design her kitchen – in her traditional cool fashion. My friends was all white – then pops of orange with matching oversize light fixtures. DIVINE. So happy to see more of her work – and I adore the dovecote!!!! That birdhouse is fantastic. Very fun! The kitchen and bathrooms are perfect. Such beautiful open spaces, she has wonderful taste. Loving that huge porch. oh i'm loven' bits and pieces of each one! – the 1st doorway is grand!!!! … loven' the work, but not my 'style' but totalllllly appreciate it the beauty! Sorry for the above delete, I had to fix my typo. Once again, you have gorgeous images! Her work is fabulous! The built-in bird houses are so much fun and a new concept for me. 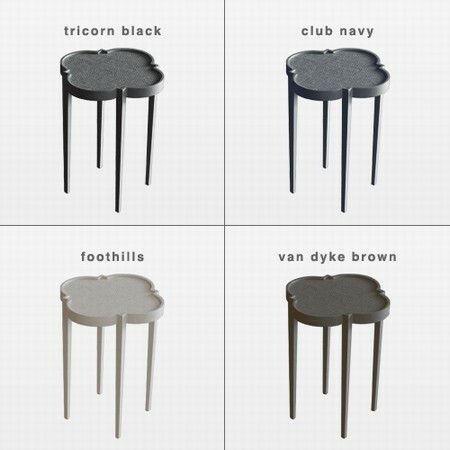 Of course, I know oomph…the side tables are the perfect compliment to most interiors. Great post. Beautiful! All these places are gorgeous! Gorgeous! That kitchen and that bathtub. 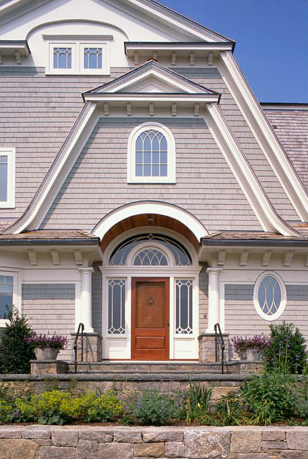 Love the arch above the front door and dormers. love all of those house! love love love the tini tables! oooh! 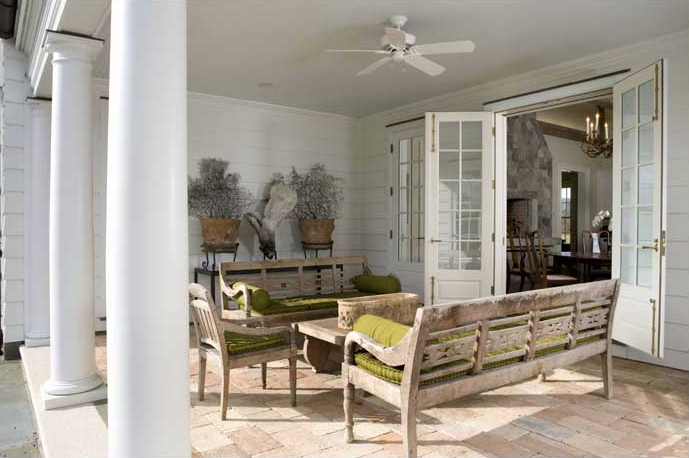 loving the porch, the kitchen, bathrooms, and all of the attention to detail – love love love!!! IF I won the lotto…. Have a wonderful day, Sus! all very amazing! I see all the femininity in her work, intricate details, the wonderful curves & those kitchens…to die for! Seriously, I just can't get enough… the kitchens and the bathrooms KILL me! Back to work for me, I'm savin up for a Louise Brooks built in bird house! Yes! I agree. She does a very good job with livable flowing spaces. Thank you, we all learn something new every day. These homes are fantastic! She is so talented and I think I would be overwhelmed by all her wonderful choices if I had the opportunity of having a custom made home. Which I think is pretty awesome. Very nice! Love the white kitchen and bathrooms! So stunning! I especially love the kitchen! That birdhouse is simply amazing! I am now a definite fan of her work. Oh that kitchen is so amazing. I dream of one day having an all white kitchen! Love her use of curved elements and the incorporated bird house is just delightful! Great recommendation. wow, go louise! outstanding work!! Wonderfully charming and inviting for any bird! We will be renovating and are using a local architect, Christina Griffin. Check out her work~ when you have time. I love how she designs for the way people live. That's very important. I also love the birdhouse addition as a signature style of hers. Lovely pics! Your blog is so inspirational to me!! Oh, so gorgeous! Love this style, I love Connecticut! Thanks for sharing Sue! XO! Such a talent! I love both master bathrooms. So clean and fresh! Love her work. Classic with such style. Ive seen those little quaterfoil tables around in recent months, and some in really bright colors… I totally love them! All of this is just such great eye candy, Sue. 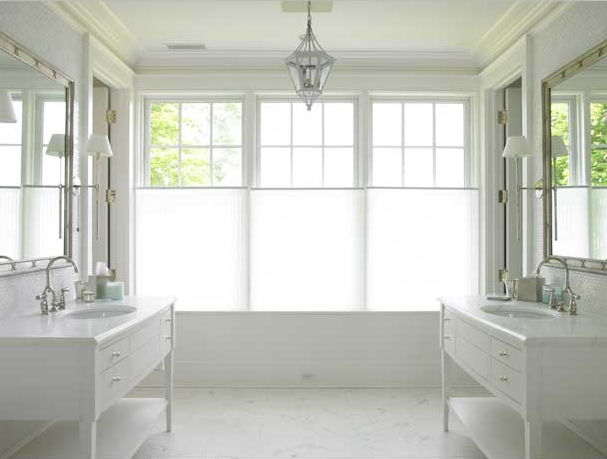 Love love LOVE that master bathroom with the pagoda chandy. And that kitchen with the touches of soft blue is yummy as well. And of course those big porches…. I want to curl up in that third image and read a book! What classic work!! That kitchen is so amazing! I love the big island. It's all so lovely. I'm glad to know about her work – that fourth image (the one from the dining room to the outdoor porch/yard and water is AMAZING. I adore that space. It's just perfect. Did I mention I love it? beautiful! i love the traditional and plain look she uses, its very refreshing! ah, those robin's egg blue pendant/lanterns above the island in that kitchen, that stopped me. seriously unique and softly amazing. all of these spaces are like a dream. just lovely! That kitchen is so delicious! Those facades are stunning and I love all of the white! 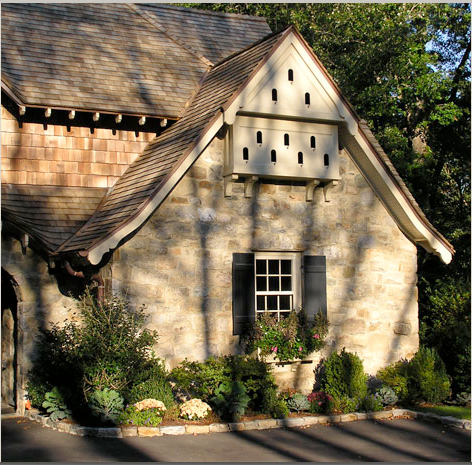 Oooh, I am totally loving the exterior architecture…..is that bulit-in bird houses in the eaves? If it is, I'm blown away…. That built in bird house looks fantastic. I haven't seen anything like that before. I love the stonework too. 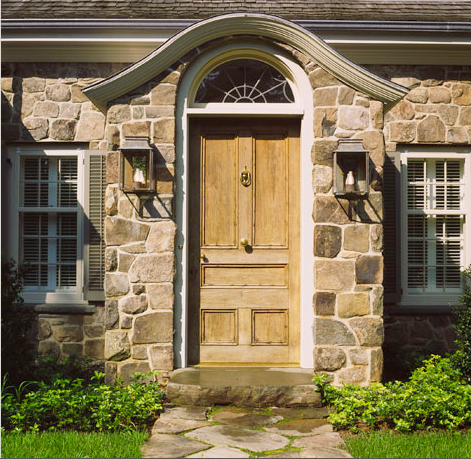 I dream of living in a stone house. Just beautiful. Oh, that outdoor patio with the indonesian furniture is to die for (I know the post is mainly about architecture, but my heart loves furniture). Speaking of furniture, those tables are great, too. Off to check out the rest of oomph. thanks for stopping by my blog!!! I am following your lovely blog now!! I am in LOVE with that kitchen. WOW!!! More fabulous work! I love that house in the second picture. So beautiful. I love those tables too!